Spruce spider mites (SSM), like other plant-feeding mites, use piercing-sucking mouthparts to feed on sap. Feeding from individual cells initially produces small, yellow splotches on needles. Over time, needles take on a dull, rusty appearance and some may drop prematurely. 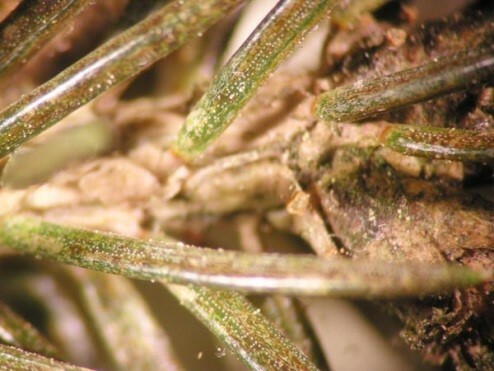 In addition to feeding on their namesake host, spruce spider mites can thrive on over 30 conifers, including juniper, yew, and arborvitae. SSM do best while temperatures are in the 60oF to 70oF range, so this spring has been good for them, and symptoms are beginning to appear on infested trees. In many cases, infested trees and shrubs do not exhibit obvious symptoms until mite numbers are very high. SSM will feed and their numbers will increase until daily high temperatures begin to hit and stay in the mid- to upper 80s. Their activity subsides until resurgence in fall. Preventing extensive visible damage by SSM depends on detecting infestations before symptoms become obvious. The small size of mites makes this challenging. Hold a white piece of paper under a branch while striking or shaking the branch vigorously 4 to 5 times to dislodge mites that may be present. Count slowly to 10, before pouring off needles and debris. Then, examine the paper carefully for the tiny olive green mites. Insecticidal soap applied with thorough coverage can provide good control. Check the label for precautions: soaps can temporarily remove the blue bloom from spruces. Repeat the sampling process about 3 days after the application to see if an additional treatment is needed.